Nokia 3310, Nokia 3, Nokia 5, Nokia 6 Arte Black Officially Launched At MWC 2017: They are back officially, and globally! The wait is over, as Nokia CEO Rajeev Suri and HMD Global CEO Arto Nummela took the stage at Mobile World Congress (MWC) 2017, Barcelona and officially announced the reincarnated Nokia 3310, alongside three Android models Nokia 6, Nokia 5, and Nokia 3. 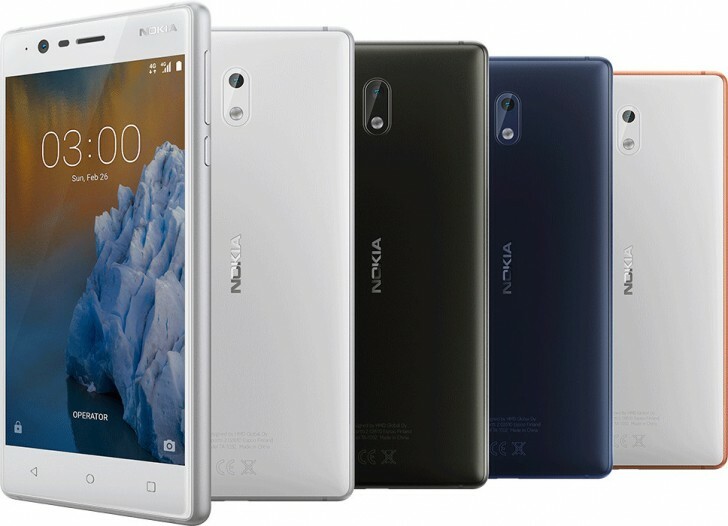 The CPO of HMD Global, Juho Sarvikas said that the Nokia handsets will not be only about specifications but will have the brilliance of real-life experiences. Nokia handsets will have premium design and build quality. Nokia 3310 has got the official launch MWC 2017 as we have already revealed in our previous article. The reincarnated handset will run on the S30+ operating system and is installed with a colored display. It features 2.5G mobile network connectivity and packed with a 2.5MP rear camera. The biggest advantage or merit of Nokia 3310 is its long battery backup with a talk time of 22 hours and about one month of standby time. It is also loaded with the modern version of your all-time favorite Snake game. You can access the internet on it through pre-loaded Opera Mini browser. The Nokia 3310 will be priced at €49 which is around $52(Rs 3,450) at the time of this writing. The handset will be made available to buy in the second quarter of 2017. Nokia 6 has got the global launch which was exclusively launched for China a few days back and received a huge success. We have already shared with the full specifications of Nokia 6 in our last article. The new thing about this handset is the price as the Nokia 6 is priced at €230 which is around $243 (Rs 16,210). Nokia 6 will also become open for sale in Q2 of 2017, in fact, all three models will become available in Q2. There was a surprise new edition to this handset- the Nokia 6 Arte Black. It is an amazing combination of colors with the sophisticated piano black finish and an increased memory of 4GB RAM & 64GB inbuilt storage. We know that it was the quantity of memory that customers are getting in general Chinese models but the Company has reduced the memory on non-Arte models to 3GB RAM & 32GB. The Nokia 6 Arte Black is priced at €300 around $317 (Rs 21,150). Nokia 5 brings down most of the specifications and price as compared to Nokia 6 specs. For price, Nokia 5 will retail at €190 around $199 (Rs. ). The android smartphone is built inside a premium aluminium unibody and installed with 5.2-inch display. The display also features the trademark polarizer which reduces the reflection by great extent. Nokia 5 is packed with Qualcomm Snapdragon 430 chipset same as Nokia 6, 2GB of RAM, 16GB internal storage, and a 3,000 mAh battery. For photography, the LTE handset has a 13 megapixel rear camera with f/2.0 & Phase detection autofocus and a wide-angeled 8 megapixel front snapper. One of the main highlight of Nokia 5 is that it will run on pure Android 7.1 Nougat OS. The smartphone will be made avialble in four colors including Matte Black, Tempered Blue, Copper, Silver. The smallest brother of this trio is the Nokia 3 which will be priced at €140 and will also be launched in Q2 2017. It seems to have Lumia series phone’s design features. 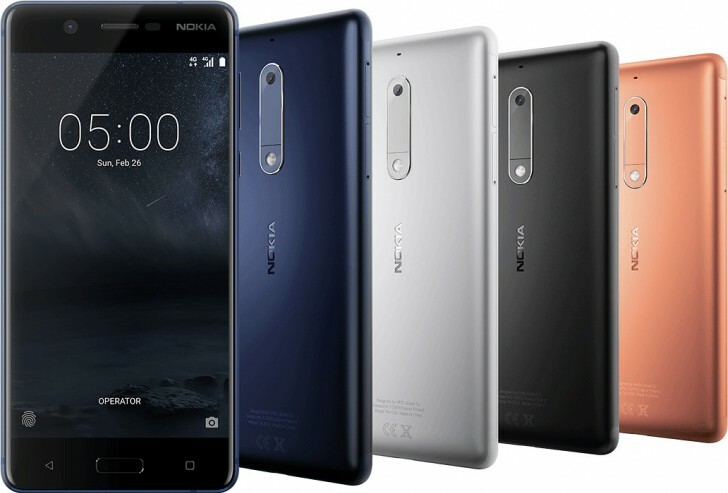 From specification end the Nokia 3 brings expectations little low but are acceptable considering the price. Best thing about Nokia 3 is the aluminium frame+ polycarbonate back, which is further topped with Gorilla Glass. It has a 5-inch HD (720pixel) display with the same trademark polarizing filter. The handset has a quadcore MediaTek MT6737 chipset, 2GB RAM, 16GB inbuilt storage, and a 2,650 mAh battery. For phography, Nokia 3 is instaalled with 8 megapixel camera with f/2.0 aperture and 1.12µm pixels, both in front and rear. As company promises you will get Google Drive space along with all the smartphones to save your data. The 3 will come in four colors including Matte Black, Tempered Blue, Copper, Silver. The company has also officially launched the Nokia 3310, Nokia 3, Nokia 5, Nokia 6 Arte Black models at the same event. In spite of all these 3 android Nokia models, Nokia 3310 was the show stealer and received all the limelight it can get at the MWC 2017. All Nokia 3310, 6, 5, and 3 models will get launch in India, Europe, Middle East, and Africa in Q2 2017.